All images by Joan Marcus. You have not lived until you have watched Patti LuPone, clad in jewels and silk, sitting on a Lucite bed using a claw grabber to pick up jewels that have strayed too far from her. Luckily, I have lived a life well lived. LuPone joins fellow Tony Award-winning actress Christine Ebersole in War Paint, a new musical that 2017 probably doesn’t deserve. 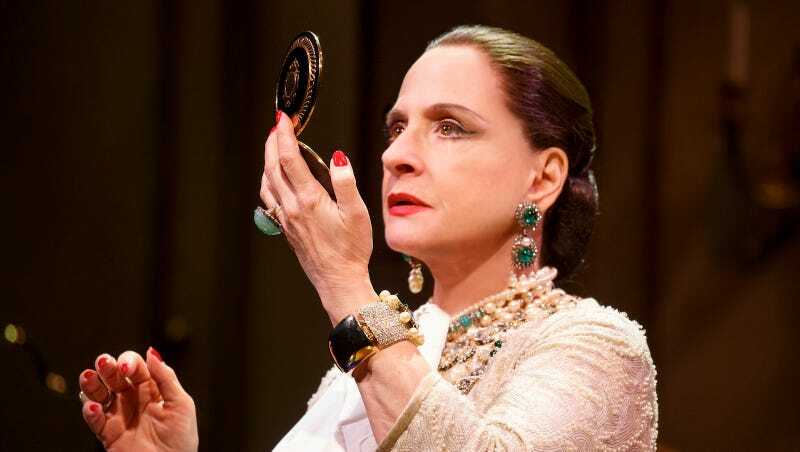 It’s a classic Broadway musical where LuPone plays Helena Rubinstein and Ebersole is Elizabeth Arden, competing makeup titans and the women responsible for the modern makeup routine. Both women came to America as immigrants—Helena from Kraków and Elizabeth from an Ontario farm—but used their makeup companies to integrate themselves into the highest echelons of New York society. Every person, down to the chorus members, is dressed impeccably. The woman responsible for that is another Tony winner. Actually, costume designer Catherine Zuber has won six, and was just nominated for another, for her work on War Paint. Her most recent win was for the 2015 revival of The King And I, a piece of theater where the sharp divides in costume tell almost as much of the story as the songs. She thrives with period pieces that require attention to details. In War Paint, this means fur stoles with animals’ faces and legs, pillbox hats, Chanel-inspired suits with thick but stylish belts and, with each scene, a growing amount of diamonds and jewels. Unlike most shows, though, War Paint takes the audience through the 1930s, ‘40s (including the rations of wartime), ‘50s and early 1960s. It’s approximately four period pieces in under three hours. The costumes were constructed in Chicago (where the musical was first premiered), New York, London, Wisconsin and Düsseldorf, Germany. Inspired by the rations of World War II, Zuber created a Rosie the Riveter jumpsuit (using a fabric with some sparkle) and pin-up G.I. Jane khaki uniforms. Zuber’s costumes for the 1950s bring out the crinoline and wide-brim hats that well-to-do women just had to have. When a man enters the show with a new cosmetics company (Revlon, maybe you’ve heard of it? ), his models are dressed in slinky, silver sequined gowns with a thigh-high slit and over-the-top red overcoats as smooth as silk for the first TV advertisements of make-up. The show ends as we enter the 1960s and gets in one last mod mini dress. Again, with sparkly sheen. Zuber’s ability to cleanly enter and exit each distinct era of fashion is unparalleled. I spoke with Zuber about dressing two Broadway titans, how to make a chorus girl cool again, and about the style of the two women who paved the way for Mary Kay, Emily Weiss, and yes, Kylie Jenner. This interview has been condensed and edited for clarity. JEZEBEL: First off: The cast is small, but each ensemble member comes out every number in a new outfit. Just how many costumes did you make for the show? CATHERINE ZUBER: I don’t really have a number, but I would bet there’s over 100 in total, including principles, covers and swings. I never really count; I just keep producing. Helena Rubinstein and Elizabeth Arden had the same goal, but two very different approaches to it. How did you construct these two versions of femininity? In the research, Helena Rubinstein had a very flamboyant style. There’s so much documentation on her and her look and the way she dressed. She was really a fountain of inspiration, just the images of her. So with the director and Patti LuPone, we were able to go through these archives. Even if we didn’t have documentation of a certain outfit she needed for a scene, there was a lot information about the type of designers she liked and we got a sense of her flamboyance and she liked to pile on the jewelry. She really was a much easier person to design for, that character. Whereas Elizabeth Arden was much more discreet and there aren’t as many photographs. In a lot of the photographs, she looks lovely, but it’s not distinctive in a theatrical way. We needed to go in and create and theatricalize her look a little more. Could you tell me about Helena Rubenstein’s jewels? As her life’s work, the company, starts to fall apart, she appears with more and more jewels each time. They’re not new purchases, they’re stuff she already has. She had a lot of jewelry. She may have sold off some pieces for finances. What was found historically is that even though her company floundered, she never had to sell anything she owned. When we did the project in Chicago last summer, we had a scene where she was selling her paintings at auction. It turned out that wasn’t true so that one-minute auction at the end of her number “Forever Beautiful” was cut. We had to cut that was that wasn’t accurate; she did hold on to possessions she already owned. She was very fashionable. If it was a white-tie occasion, she wouldn’t be opposed to wearing something vintage. She created her own kind of fashion by the way she put her clothes together. Pink is having a moment again, but it seemed like we actually have Elizabeth Arden to thank for that. After all, you couldn’t have millennial pink without Arden Pink. We worked with Christine to make sure she felt like the costumes were speaking to her as Elizabeth Arden. It was really a collaboration. For Elizabeth Arden, they really wanted her to have pink be her signature color. The song “Pink” is her finale number. In the very first scene, in the ‘30s, the salon is so pink and all the young girls who work in the salon are in pink and then the ladies who are the clients are in pink. We felt that her first appearance also needed to be in pink to establish that as her signature color from the beginning. We do deviate a bit from that because we didn’t want it to be every single outfit had to be pink. But it was a color we kept returning to. I would love to talk about the accessories of the show. It seems every person on stage has a new fur or hat in every number. In the final song they sing, which includes in the lyrics “Back when there was beauty in this world”—I think they’re reflecting on a time where a well dressed woman would have a hat, jewelry, gloves, a purse and hosiery and a wardrobe of shoes to go with every outfit, and furs. All of that was part of the vocabulary of a well dressed woman and what she could cull from in order to create an elegant appearance. We felt like all those items were really important. It also helped to tell us the time period because each period has its own very distinctive silhouette and the hats really help to establish that. Also, our ensemble isn’t that large, and when you have an ensemble you normally don’t want to cover people’s faces, but in some instances it was okay to obscure. Could you talk about adapting these very classic looks, like the Dior suits? The good thing is the inside of the costumes are quite durable. But we try to keep the outsides as feminine and light as possible. Because of quick changes, a lot of the garments have to have a big, ol’ zipper down the back, unfortunately. But people are taking clothes on and off, on and off, and it seems better to just nail down the trimmings on the front so something won’t get left behind on a quick change. The lesser of all evils is to have a zipper down the back and keep the costume intact-looking from the front. One of my favorite scenes, visually, is when Elizabeth Arden and Helena Rubenstein are battling to create make-up during World War II, when their normal ingredients have been rationed. You dress the ensemble behind them in great G.I. Jane and Rosie the Riveter jumpsuits. The Rosie the Riveter jumpsuits are, of course, based on the famous Rosie the Riveter “We Can Do It” poster. I looked at a lot of period jumpsuits, and it took a long time to get the right proportions on those. First, they really looked like chinos and a work shirt. It was by lifting the waist and having them skim over the hips, which created a more user-friendly silhouette. Then we put pads in the shoulders to give it more ‘40s shoulder line, and used a fabric with a little sparkle to give a showbiz element to Rosie the Riveter. We added little tufts of wigs to the front of the headscarf as well, which meant it could go on quickly and gives the head a nicer shape. The flacks are based on pin-up drawings from World War II. I had done a production of South Pacific [which won a Tony Award], and we were looking at a lot of pin-up art and art that was painted on aircrafts. So this ended up being a really fun, theatrical way that allowed the girls to do the dance number they needed to do and show that they had used makeup to do seams in their stockings to bring a bit of fun to the proceedings. Could you talk about the differences in designing looks for the more anonymous ensemble member versus Helena and Elizabeth, who you had direct inspiration to work from? I think they have to be individually interesting, but live together as a group. And they can’t take focus away from the leads. Whatever the project, it’s always a balance to have them be true the character they’re playing but still hang together as a chorus. Because we didn’t have a huge chorus, it just seemed the right way to embellish the time period. By utilizing the people we did have and giving them each an individual look. Caitlin Cruz is a freelance reporter and writer in Brooklyn and Texas. She frequently tweets about Bad Men @CaitlinRCruz.